Pluto's Secret: An Icy World's Tale of Discovery by Margaret Weitekamp with David DeVorkin. Review: Have you ever heard about the interesting journey of the dwarf planet Pluto? Well, Pluto's Secret is an incredible and interesting book for kids! This informational story is written by Margaret A. Whitecap and David Devorkin and illustrated by Diane Kidd. Experience the tremendous adventure of amazing, icy world Pluto is told. In this fantastic story, readers learn about the incredible journey of Pluto. Percival Lowell announced him as a ninth planet but Pluto wasn't very pleased with that idea, though he rather likes his name. He already knows he is different from the other planets; he just likes being recognized with his friends in the Kuiper's Belt. Read Pluto's Secret to find out if Pluto will become an official planet, or if he will become just another object that orbits the sun. This book is really fun for learning because instead of reading some boring textbook about Pluto, readers go on a massive adventure. I personally loved this book because it is so entertaining. I mean Pluto is the name of the god in the underworld in mythology, which makes it even more interesting! The fact that this book is informational is even better because you can read it in school! I also loved how the authors made the planets people instead of objects because it adds emotions and character to them. Although some parts in the book are repetitive it is still a great story for! Read Pluto's Secret, gain some knowledge, and have a fun time! 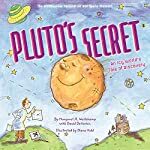 We would like to thank Abrams Books for providing a copy of Pluto's Secret: An Icy World's Tale of Discovery for this review. Have you read Pluto's Secret: An Icy World's Tale of Discovery? How would you rate it?